To troubleshoot what ECDN servers are visible from a location, you have two choices. 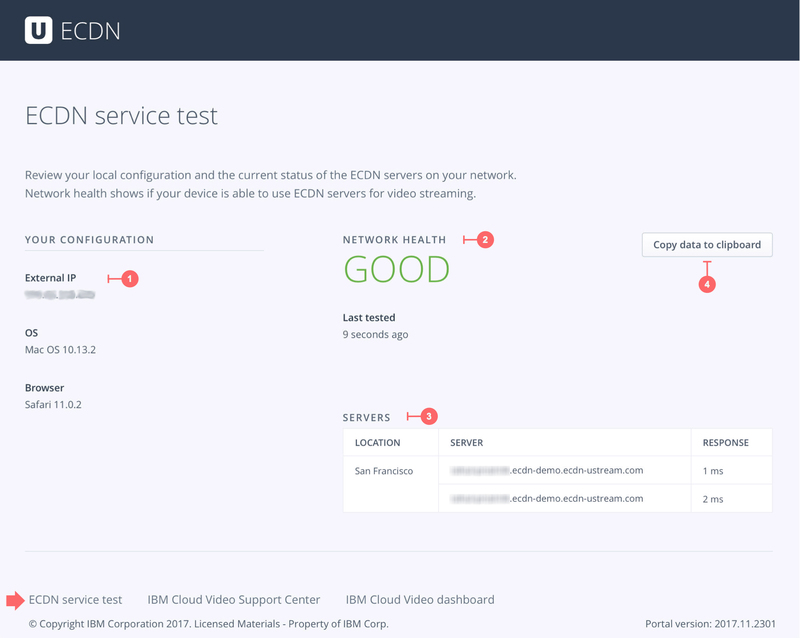 Use the IBM Cloud Video - Network Test Tool - a Docker based tool - requires software installation. We describe these tools below. This is a quick way to get basic information by visiting this page in a browser. On a machine connected to local network in the remote location, in a browser, visit the following URL: https://ecdn.deepcaching.com/service-test.html. No login is required, so you may also share this URL with your co-workers. Your external IP address - this is your egress IP address - IBM Cloud Video platform sees a playback request originating from this IP address. "Good" means ECDN servers are available and within reasonable latency. "Poor" means no ECDN servers are available from this location. List of all ECDN servers visible to this location, and the HTTPS ping response times to each of them from the current location where the browser is running. This button copies all the data to the clipboard, and can then be shared for debugging purposes. The link to the "ECDN service test" page is also found in the footer of all pages in the ECDN Management portal (as shown by the arrow). Sometimes, you may need more information about not just about ECDN servers, but also information such as traceroutes and latency to other servers, such as content ingest servers, etc. used in the delivery of video content, you can use this network test tool. It is a Docker based tool, and requires you to first install the Docker runtime on the client test machine. This tool can also display the ECDN information. This article describes this tool in more details.